Gravity is a natural phenomenon by which all things with mass or energy are brought toward each other. In 1687, Isaac Newton explained the phenomenon as a force, which was formulated in Newton’s law of universal gravitation. Flat-Earthers insist that gravity does not exist. But this is only a result of a mere ignorance on how gravity works. Everything in our lives is consistent with what is explained in Newton’s law of universal gravitation. 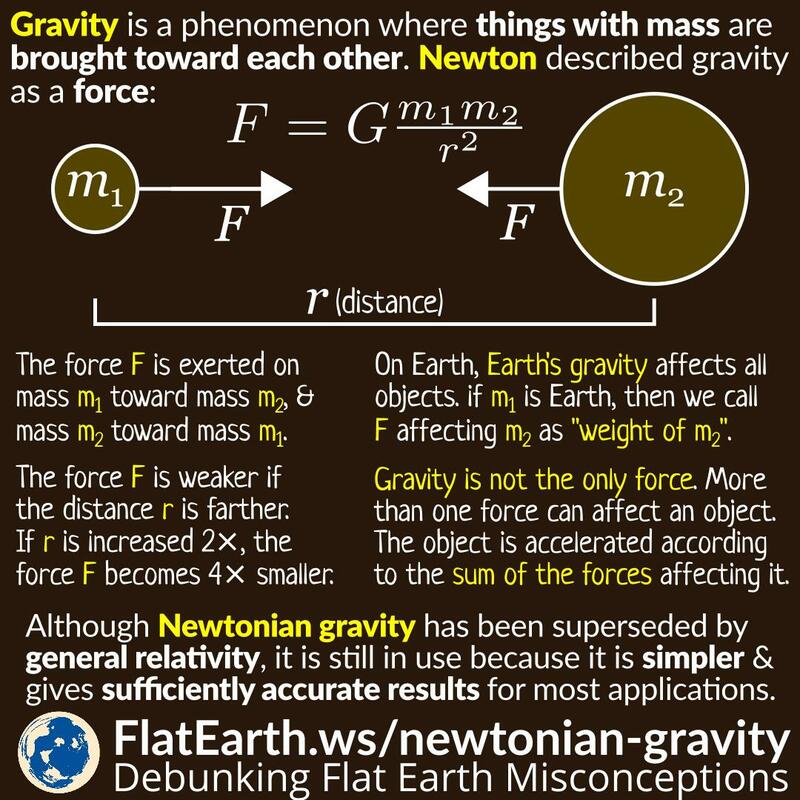 Gravity causes two objects with mass m1 and m2 to have the force F toward each other. The force F is weaker if the distance between them is farther. If they are twice farther, then F is four times smaller. On Earth, Earth’s gravity exerts force to every object. We call this force as ‘weight’. In our illustration above, if m1 is the Earth, and m2 is an object, then the force of gravity exerted on m2 is what we call ‘weight of m2’. Gravity is not the only force. There are many other forces. An object can be influenced by more than a force, and gravity is only one of them. An object is accelerated according to the sum of the forces affecting it. Flat-Earthers often take the fact that an object moves against the direction of gravity as ‘evidence’ of the non-existence of gravity. They are wrong. The object moves in such a way because there are forces other than gravity affecting it. Some things cannot be explained by Newton’s law of universal gravitation, like the orbit of Mercury. To solve this problem, there is Einstein’s theory of general relativity, which is an entirely separate explanation of gravity, among other things. But for most of the things we do every day, Newton’s explanation of gravity is accurate enough. Both Newton’s law of universal gravitation and Einstein’s theory of general relativity will yield the same results for practically every problem we encounter every day. But Newton’s explanation has the advantage of being much simpler than Einstein’s. It is the reason we are still using Newton’s law to solve everyday problems involving gravity.